Hillary Chybinski: keeping kids entertained. . .
keeping kids entertained. . .
need a simple and inexpensive craft activity for your kiddos? Try this. - paper scraps - cut into shapes. I used some of my paper punches - you could also use decorative scissors to trim around the edges. That's it - I cut out a bunch of shapes from my scrapbooking paper scrap files - all different colors and patterns. I put them all in a small pizza box (from California Pizza Kitchen - YUM) so my kids can access them when they want to. 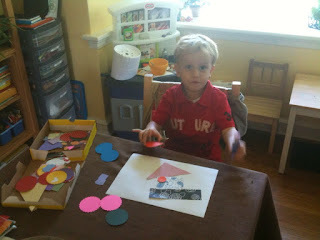 I give them some construction paper and a glue stick - and they make pictures using the different shapes and patterns. What are some of your favorite easy kids' crafts?